I could feel it setting in: the rhythm, comforting as the twang of a slightly out-of-tune guitar. Wake up, clear my field, water my plants, fish for a bit, talk to folks, give gifts to pretty folks, go to bed. Starting Stardew Valley was like a homecoming for me. The home in question? Harvest Moon 64. Stardew Valley is a new Steam game about farm life. No, no, this isn’t cut from the same cloth as Farmville or modern farming/social exploitation simulators like that. Stardew Valley is a character-driven farming RPG. You spend each day working on the farm (or mining, or fishing, or exploring), all while meeting people and getting increasingly involved in their lives. It’s a lot like Harvest Moon, if you’re familiar with that series. OK, it basically is a new Harvest Moon. Classic Harvest Moon games (especially the Nintendo 64 version) hold a special place in my heart. My cousin and I used to play them endlessly when we were kids growing up deep in the heart of suburban Texas, dreaming of growing up deep in the heart of rural Texas. The charm of those games was manifold: They offered a great deal of freedom while providing you with multiple avenues toward tangible, daily progress. You could cultivate plants, raise livestock, go fishing, mine, or tug away at udders until you had yourself a goddamn dairy empire. They were also glorified dating simulators. You could romance single ladies by incessantly giving them gifts that corresponded to their interests (Girl Named After Flowers likes flowers, etc), and eventually you could get married, have a kid, etc. Then your wife would spend a bunch of time in the kitchen and... well, I never said Harvest Moon 64 was the most progressive game ever. But it was great, and it owed a lot of its greatness to the simple, soothing rhythm of day-to-day farm life. Each day, you’d do roughly the same thing, but you’d expand your operation a little, or uncover a secret by exploring, or have a special event with a romantic interest. Naturally, you’d then say, “Wellll, I guess I have time to play one more day.” Then you’d play for eight hours. Stardew Valley nails that appeal to a tee, or to a farmer’s tan cultivated by a sweat-stained T-shirt. To be honest, it skirts at the edges of being a shameless clone. It really is pretty much the same as classic Harvest Moon in a whole lot of different areas. Planting things is the same, upgrading tools is the same, selling the goods you’ve harvested is the same (all the way down to the box outside your house). Other mechanics like currying favor with townsfolk, exploration, fishing, and cooking are broadly similar. The similarities are so glaring, in fact, that the game sometimes just kinda assumes that you played Harvest Moon back in the day. It doesn’t really teach you much, and though the game isn’t terribly complicated, I realize that I would’ve had to look up a lot of things if I hadn’t poured a decent portion of my childhood into Harvest Moon 64. But I am SO into it right now. 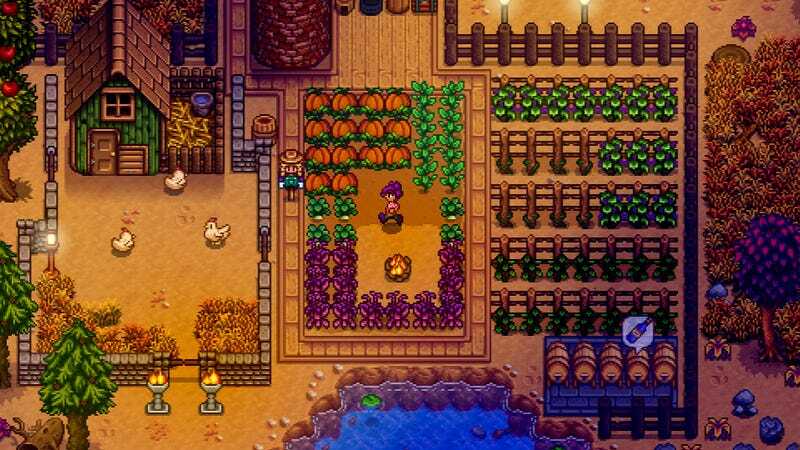 Stardew Valley nails the simple charm of Harvest Moon. It’s a love letter through and through, a spiritual successor to a series that’s barely had a presence on PC in the past. (Most recently, PC got a port of the thoroughly made-for-mobile Harvest Moon: Seeds of Memories. The less said of that, the better.) Each little thing is so satisfying, from busting up rocks and stumps in your field (those sound effects) to learning what gifts everybody reacts best to by carefully parsing what they talk to you about. It’s ugly and shameful, but it’s mine. I cleared out all the rocks and shrubs and planted a few types of seeds. Then I, uh, got distracted by fishing for a while. Still, I’m already weirdly pleased by my ramshackle plot of dirt and dreams. I already want to show it off. The game’s story also has a modern edge to it. Before you reboot your life by moving into your grandfather’s old farm, you’re a drone at a soulless, Walmart-like corporation. That corporation has a location in your new home city, and its outlook is, well, bleak. No, it’s not the most nuanced thing ever, but if that’s what you’re looking for, I’m not entirely sure why you decided a cartoon farm life simulator would scratch the itch. When the series is at its best, Harvest Moon combines simplicity, relaxation, and freedom with systems that go deeper than you’d expect. Stardew Valley—at least, based on my first few hours with it—is more or less the same, but with modern touches and a slicker (though still kinda messy) interface. I’m a bit worried that aspects of it—characters and story, mainly—might be too nice and simple, verging on generic, but I haven’t played enough to know for sure yet. Similarly, I can’t make a call on the game’s overall pace or progression yet. Right now it feels a little slow and sparse, but we’ll see. It’s quite fitting, though, that Stardew Valley is the story of a young man, woman, or purple anime alien inheriting a farm from their Santa grandpa. Stardew Valley, after all, has inherited Harvest Moon’s spirit, for better and worse.